Miroslav AKMADŽA Crkva i država. Dopisivanje i razgovori između predstavnika Katoličke crkve i komunističke državne vlasti u Jugoslaviji. Svezak I. 1945.-1952. Crkva i država. Dopisivanje i razgovori između predstavnika Katoličke crkve i komunističke državne vlasti u Jugoslaviji. Niz: Radovi, knj. 16. Zagreb 2008. Niz: Radovi, knj. 16; Crkva i država, knj. 1. Izd. Društvo za povjesnicu Zagrebačke nadbiskupije “Tkalčić”, Zagreb; Hrvatski institut za povijest – podružnica za povijest Slavonije, Srijema i Baranje, Slavonski Brod. Riječ urednika ( Stjepan Razum zc), str. 5. – 8. Ocjena rukopisa (1.) (dr. Stjepan Kožul), str. 9-11. Ocjena rukopisa (2.) (dr. Agneza Szabo), str. 11-14. 0.1. Uvodne napomene, str. 15-17. 0.2. 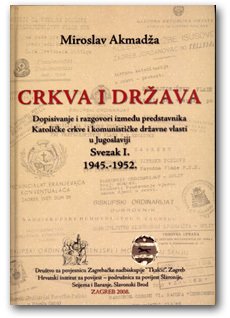 Pregled crkveno-državnih odnosa od 1945. do 1952., str. 17-29. Pastirsko pismo (19); Izazvani izgredi (20); Protucrkveni zakoni (21); Sudski postupci (23); Svećenička staleška udruženja (25); Prekid diplomatskih odnosa (28). I. Opće dopisivanje, str. 31-284. II. Predmetno dopisivanje, str. 285-706. 1. Zauzimanje crkvenih vlasti za svećenike i druge osobe kojima se sudi ili su već osuđeni, str. 287-301. 2. Napadi na biskupe i svećenike, str. 302-327. 4. Vjerske škole, str. 371-422. 5. Zauzeća crkvenih zgrada, str. 423-502. 5.1. Zaposjednuće Nadbiskupskoga dječačkog sjemeništa u Zagrebu (Voćarska cesta), str. 423-426. 5.2. Zgrada Dubrovačkoga kolegija, str. 426-429. 5.3. Zaposjednuće župnog dvora u Ozlju, str. 429-430. 5.4. Zauzeće školske zgrade Družbe sestara “Kćeri Božje ljubavi” u Legradu, str. 430-431. 5.5. Nadbiskupski konvikt u Požegi, str. 431-433. 5.6. Župna kuća u Vodicama, str. 433-435. 5.7. Ispražnjenje sjemenišnih zgrada u Splitu, str. 435-438. 5.8. Preuzimanje nekretnina Vjerozakonske zaklade, str. 439-440. 5.9. Ostala zauzeća i predmeti vezani za zauzeća crkvenih zagrada, str. 440-502. 6. Pljenidbe (konfiskacije), str. 503-516. 6.1. Pljenidba “Narodne tiskare”, str. 503-508. 6.2. Pljenidba kinematografa “Prosvjeta”, str. 508-516. 7. Izvlaštenja (eksproprijacije), str. 517-520/525. 7.1.Izvlaštenje “Doma za klerike Hvarske biskupije”, str. 520-525. 8. Agrarna reforma, str. 526-578. 9. Otuđenja nadarbinskoga zemljišta, str. 579-581. 10. Ostali oblici oduzimanja crkvene imovine, str. 582-608. 10.1. Oduzimanje prava korištenja samostana crkvenim redovima, str. 582-605. 10.2. Oduzimanje i nezakonito korištenje crkvenog zemljišta, str. 605-608. 11. Oskvrnuća vjerskih zgrada i znakova, str. 609-627. 12. Vjerski blagdani, str. 628-636. 13. Prikupljanje milodara, str. 637-647. 14. Matične knjige, str. 648-675. 16. Smetnje dušobrižništva u bolnici Sestara milosrdnica u Zagrebu, str. 698-703. 17. Vjerski tisak, str. 704-706. Izvori i literatura, str. 709-711. Popis sažetaka isprava, str. 714-757. Summary (Conclusion): The Church and the State. Correspondence and Discussions between Representatives of the Catholic Church and the Communist Government in Yugoslavia. Volume I. 1945-1952, str. 761-763. After the end of World War II, the communist regime in Yugoslavia saw the Catholic Church as a strong opponent that could threaten its existence. The communist regime accused the Catholic Church of collaborating with the Ustashi regime and could not come to terms that there was one such strong and numerous organizations that was religiously and nationally engaged yet not under its control. At the same time the Catholic Church could not come to terms with the fact that it would have to cooperate with a government – and once again a Yugoslav government – that based its rule on atheistic ideology. At the very start of this forced symbiosis of these two authorities with opposing ideologies it was obvious that intolerance existed between the State and Church. Even though the State launched carefully in trying to regulate its relations with the Catholic Church in practise it led way to further intolerance in the Catholic Church towards the new government. The Communist government launched a show down with the Catholic Church which was reflected in murders and the imprisonment of priests, mounted trials, bans on the religious press, abolishing Religious Instructions from schools and an entire series of other oppressive measures limiting religious freedom and of course the confiscation of Church property. These quite unfavourable circumstances set the scene for agrarian reforms and the first confiscations, expropriation and first wave of nationalisation of Catholic Church property. Agrarian reforms were the most dramatic for the Catholic Church. Agricultural land was one of the most significant sources of revenue which made it possible for the Catholic Church to revive. Intense agrarian reform over Church property put the Catholic Church in a very difficult material position and the faithful had to take on the burden of supporting the activities of the Church even though they themselves were faced with a difficult economic situation following the war. After the agrarian reform was implemented various taxes were imposed on the Catholic Church particularly on the remainder of any land left in its ownership which meant that the Church was compelled to give away or allow peasants to use the land or other cooperatives and various organisations which later led to problems in trying to retrieve this land. The communist regime headed by Josip Broz – known as Tito – attempted to control Church authorities in Yugoslavia and endeavoured to weaken the Church’s ties to the Holy See and set up a “national Church” that would be under the supervision of the new government. The most ardent opponent to these policies was Zagreb Archbishop and the then President of the Conference of Bishops of Yugoslavia, Alojzije Stepinac. Other bishops in principle supported him even though there were some who were prepared to cooperate with the government but never to the point that they would renounce the Holy See. The communist government believed that it count on the disunity of the bishops however in September 1945 the bishops unanimously signed a pastoral letter in which the sharply condemned the behaviour of the new government. The communist government then stopped using ‘tactful’ methods and openly embarked on a war with Archbishop Stepinac and the Catholic Church. Priests were arrested with even more fervour, the religious press was completely banned, Church property was confiscated and Religious Instructions banned from schools. Religious schools were closed down completely. The climax in this attack on the Catholic Church was a mounted trial against Archbishop Stepinac. Nevertheless, imprisoning Archbishop Stepinac did not manage to put the Catholic Church under the government’s control but just led to even further intolerance amongst the majority of the Croatian people and democratic world against the new Yugoslav regime. Mounted trials against members of the Catholic Church and other opponents of the regime and the introduction of a one-party system created a picture of Yugoslavia in the world of being a totalitarian state. As a result of the unfavourable international circumstances Yugoslavia endeavoured to maintain at least a minimum level of diplomatic relations with the Holy See. During the period of the Yugoslav conflict with the USSR, there appeared to be calm in the storm in Church-State relations. However the government persevered in destroying the unity that existed in the Catholic Church. Its last attempt in this aim was to set up class societies for priests. The government tried to get priests to join their societies and this way creates a division amongst them and of course the authorities in the Catholic Church and introduces the idea of a “national church”. This idea had a little more success, what by force or by will amongst priests in Slovenia and Bosnia and Herzegovina while it completely failed in Croatia. The bishops and Holy See prohibited membership into these societies and this led to further problems in relations between the Catholic Church and the communist regime. The Yugoslav government sent a protest letter to the Holy See which led a protest letter in response from the Holy See where the problems in Vatican-Yugoslav relations were clearly defined. This led to a decision by the Holy See to appoint Archbishop Stepinac to the rank of a cardinal which then led to the Yugoslav government broke its diplomatic relations with the Holy See. Résumé (Conclusion): L’Église et l’état. La correspondance et les pourparlers entre les représentants de l’Église catholique et le régime étatique communiste en Yougoslavie. Volume I. 1945-1952, str. 763-765. À l’issue de la Seconde Guerre mondiale, le régime communiste en Yougoslavie voyait en l’Église catholique un fort adversaire qui pouvait menacer sa survie. Outre les accusations de collaboration avec le régime oustachi qu’il proférait contre l’Église catholique, le régime communiste ne pouvait tolérer l’existence, dans le pays, d’une si nombreuse et si forte organisation, engagée sur le plan religieux mais en même temps sur le plan national aussi, qui n’était pas sous son contrôle. En même temps, l’Église catholique ne pouvait accepter le fait que l’État, yougoslave de nouveau, serait gouverné par un gouvernement qui fondait son activité sur l’idéologie athéiste. Tout au début de cette symbiose forcée des deux pouvoirs aux attitudes opposées, il existait une inimitié ouverte entre l’État et l’Église. Malgré la prudence avec laquelle le régime communiste aborda le réglage des rapports avec l’Église catholique, dans la pratique, ses agissements entraînèrent une inimitié encore plus prononcée de l’Église catholique envers le nouveau gouvernement. La guerre que le régime communiste proclama contre l’Église catholique se traduisait par divers moyens: meurtres et emprisonnements des prêtres, procès spectacles, interdictions de la presse religieuse, supression de l’éducation de la religion dans les écoles publiques, ainsi que par toute une série d’autres formes de violation des libertés religieuses et la réquisition des biens ecclésiastiques. Dans ces circonstances fort défavorables les nouvelles autorités procédèrent à la mise en oeuvre de la réforme agraire qui vint compléter les mesures de réquisition, d’expropriation et de la première nationalisation des biens de l’Église catholique déjà en place. L’Église catholique fut particulièrement frappée par la mise en oeuvre de la réforme agraire. Les terres agricoles constituaient l’une des principales sources de revenus de l’Église catholique. La mise en oeuvre méticuleuse de la réforme agraire dans les propriétés ecclésiastiques amena l’Église catholique dans une position fort difficile et les croyants dans un état où ils prirent, par obligation volontaire, le fardeau de l’activité de l’Église à leur charge, et cela dans un cadre de vie d’après-guerre en soi difficile. Vu les nombreux impôts que l’Église catholique se vit imposer à la suite de la mise en oeuvre de la réforme agraire, y inclus ceux sur le reste de ses propriétés, restées en ses mains, maintes paroisses se virent dans l’obligation, étant dans l’impuissance de payer les impôts, de renoncer aux propriétés qui leur restèrent après la réforme agraire en les abandonnant à l’usage des paysans, collectivités agricoles et diverses organisations sociales, ce qui, par la suite, leur compliqua considérablement le processus de restitution de ces propriétés. Le régime communiste avec son chef Josip Broz, dit Tito, essayait d’amener les pouvoirs ecclésiastiques en Yougoslavie à affaiblir leurs liens avec le Saint-Siège, ce qui lui permettrait d’établir par la suite une «église populaire» qui serait soumise au contrôle des nouvelles autorités. L’archevêque de Zagreb et président de la Conférence des évêques de Yougoslavie, Alojzije Stepinac, dressait la plus grande opposition à cette politique. Les autres évêques le soutenaient, par principe, bien qu’il s’y trouvât d’évêques prêts à une collaboration plus étroite avec les autorités qui, cependant, n’allait jamais aussi loin que de mettre en question leur loyauté au Saint-Siège. Le régime communiste comptait sur une possible désunion parmi les évêques mais lorsque tous les évêques signèrent unanimement, en septembre 1945, une lettre pastorale dans laquelle ils condamnaient fermement les agissements du nouveau gouvernement, le régime communiste abandonna sa tactique de petits pas et entama une guerre ouverte contre l’archevêque Stepinac et l’Église catholique. Le nombre d’arrestations des membres du clergé ainsi que les mesures telles qu’interdictions de la presse religieuse, réqusition des biens ecclésiastiques, diminution de l’éducation religieuse, fermeture d’écoles religieuses et autres moyens de répression des libertés religieuses s’intensifièrent. Le comble de la répression exercée par le régime communiste contre l’Église catholique fut atteint par le procès et le verdict contre l’archevêque Stepinac. Cependant, par l’incarcération de l’archevêque, le gouvernement ne réussit pas à placer l’Église catholique sous son contrôle, tout en provoquant une hostilité encore plus prononcée de la plupart du peuple croate comme du monde démocratique envers soi. Par des procès spectacles contre les membres de l’Église catholique et d’autres adversaires du régime, ainsi que par la mise en place du régime de parti unique, la Yougoslavie se vit ranger, par le monde démocratique, dans le rang d’états totalitaires. À cause des circonstances internationales défavorables, la Yougoslavie essayait toutefois de maintenir à tout prix les relations diplomatiques, faibles qu’elles fussent, avec le Saint-Siège. Au temps du conflit qui opposa le gouvernement yougoslave à l’U.R.S.S. il y eut une trêve apparente dans les affrontements entre l’État et l’Église. Néanmoins, pendant toute cette période les autorités essayaient de trouver le moyen par lequel elles rompraient l’unité de l’Église catholique. Le dernier essai qui y visait fut l’établissement des associations des prêtres en fonction des classes sociales. Par ces associations le gouvernement envisageait de rompre l’unité de l’Église catholique, et notamment d’affaiblir le pouvoir ecclésiastique, et de réaliser par conséquence son objectif d’établissement de l’ «église populaire». Un succès quelque peu plus grand dans la fondation desdites associations, dont les rangs étaient remplis par force ou par privilèges, était enregistré en Slovénie et en Bosnie-Herzégovine, tandis que le même effort connut un échec complet en Croatie. Étant donné que les évêques en Yougoslavie, avec le soutien du Saint-Siège, interdirent au clergé de joindre lesdites associations, les relations entre l’Église catholique et le régime communiste en devinrent encore plus tendues. À cause de ladite interdiction, le gouvernement yougoslave adressa une lettre de protestation au Saint-Siège, à laquelle le Saint-Siège répondit par une lettre de protestation à son tour, dans laquelle il dénonça tous les problèmes qui ternissaient les rapports entre le Vatican et la Yougoslavie. La décision du Saint-Siège, qui suivit, de promouvoir l’archevêque Stepinac à la dignité cardinalice, servit par la suite de prétexte au gouvernement yougoslave de rompre les relations diplomatiques avec le Saint-Siège. Zusammenfassung (Schlussfolgerung): Staat und Kirche. Korre­spondenz und Verhandlungen zwischen den Vertretern der Katholischen Kirche und der kommunistischen Staatsmacht in Jugoslawien. Band I. 1945-1952, str. 766-768. Nach dem Ende des Zweiten Weltkrieges betrachtete das kommunistische Regime in Jugoslawien die katholische Kirche als einen starken Gegener, der das Bestehen des Regimes gefährden könnte. Nicht nur dass die Kommunisten die katholische Kirche der Kollaboration mit dem Ustascha-Regime beschuldigten, sie konnten auch nicht akzeptieren, dass in dem Land eine so grosse und starke, sowie religiös und national engagierte Organisation wirkt, die überdies nicht unter ihrer Kontrolle stand. Gleichzeitig hatte auch die Katholische Kirche ihre Probleme damit, dass in dem Staat, der wiederum Jugoslawien hiess, eine Partei regieren werde, deren Wertsystem auf der atheistischen Ideologie gründete. Schon zu Beginn dieser Zwangssymbiose von zwei Obrigkeiten mit gegensätzlichen Weltanschauungen herrschte zwischen dem Staat und der Kirche offene Feindseligkeit. Obwohl das kommunistische Regime die Frage des Verhältnisses zur katholischen Kirche sehr vorsichtig behandelte, sein Verfahren hat die Situation in der Praxis nur noch schlimmer gemacht und eine noch grössere Unverträglichkeit gegenüber der neuen Herrschaftsmacht hervorgerufen. Die neue kommunistische Regierung begann mit der katholischen Kriche abzurechnen, die Priester wurden ermordert und ins Gefängnis aufgrund unrechtmässiger Gerichtsverfahren gesteckt, dazu wurde Kirchenpresse verboten und Religionsunterricht aus Staatsschulen verbannt, sowie kirchliches Vermögen konfisziert. In diesen erschwerenden Umständen wurde auch die Agrarreform durchgeführt, sowie Enteignung, Expropriation und die erste Verstaatlichung des Kricheneigentums. Die Durchführung der Agrarreform war ein besonders schwieriger Schlag für die Katholische Kirche. Die Landwirtschaft war eine ihrer wichtigster Einnahmequellen. Die radikale Anwendung der auch Krichengüter betreffenden Agrarreform brachte die Katholische Kriche in eine tiefe materielle Not, und zwang die Gläubigen zur Übernahme der Lasten für die Tätigkeit der Kirche, als ob ihr Leben in der Nachkriegszeit nicht schon genug hart war. Bezüglich der verschiedenen Steuern, die der Kirche nach der Beendigung der Agrarreform auferlegt wurden, auch für den übriggebliebenen Teil des Grundbesitzes, mussten viele Pfarreien, da sie die Steuern nicht bezahlen konnten, diesen Grundbesitz veräussern, d.h. den Bauern, landwirtschaftlichen Genossenschaften und verschiedenen gesellschaftlichen Organisationen verpachten. Später gab es Probleme bei der Rückerstattung dieses Besitzes. Das kommunistische Regime mit Josip Broz genannt Tito an der Spitze, versuchte die Kirche in Jugoslawien dazu zu bewegen, ihre Beziehungen zum Heiligen Stuhl abzuschwächen und die “Volkskirche” zu gründen, die dann unter der Aufsicht des Regimes gestanden hätte. Den grössten Widerstand gegen eine solche Politik leistete der Zagreber Erzbischof und der Präsident der Bischofskonferenz der Bischöfe Jugoslawiens Alojzije Stepinac. Die anderen Bischöfe haben ihn in der Regel unterstützt, obwohl einige auch für eine stärkere Zusammenarbeit mit der Regierung bereit waren, aber niemals in dem Sinne, dass sie ihre Treue gegenüber dem Heiligen Stuhl entsagen würden. Das Regime rechnete mit der möglichen Uneinigkeit der Bischöfe, aber als sie alle einstimmig den Hirtenbrief im September 1945 unterzeichnet haben, in dem sie das Vorgehen der neuen Staatsgewalt hart verurteilen, verzichtete das Regime auf jede taktische Umsicht und sagte dem Erzbischof Stepinac und der katholischen Kriche den Krieg an. Die Zahl der Verhaftungen wurde immer grösser, Kirchenpresse erstickt, Eigentum weggenommen, Kirchenunterricht reduziert und Krichenschulen wurden geschlossen. Alle Formen der Glaubensfreiheit gingen verloren. Doch den härtesten Schlag für die Katholische Kirche stellten das eingeleitete Gerichtsverfahren und der Urteilsspruch gegen Erzbischof Stepinac dar. Aber auch nachdem er ins Gefängnis gebracht wurde, konnte sich die Katholische Kirche auch weiter der Kontrolle der Regierung entziehen, die sich dadurch noch grössere Feindseligkeit der Mehrheit des kroatischen Volkes sowie der demokratischen Weltöffentlichkeit zugezogen hatte. Durch die unrechtmässigen Gerichtsverhandlungen gegen die Mitglieder der Katholischen Kriche und anderen Regimegegener, sowie duch die Einführung des Einparteiensystems, wurde Jugoslawien in den Augen der demokratischen Weltöffentlichkeit zu einem totalitären Staat. Wegen der ungünstigen internationalen Verhältnisse versuchte Jugoslawien dann doch um jeden Preis die diplomatischen Beziehungen zum Heiligen Stuhl einigermassen zu unterhalten. Zur Zeit des Konfliktes der jugoslawischen Regierung mit der Sowjetunion, beruhigte sich scheinbar das Zerwürfnis mit der Kirche. Aber das Regime hat die ganze Zeit geplant, die Einheitlichkeit der Katholischen Kirche zu zerschlagen. Der letzte Versuch um dieses Ziel zu verwirklichen, bestand in der Gründung der ständischen Priestervereinigungen. Der Zweck dieser Vereinigungen war die Schwächung der Kirchengewalt und Errichtung der “Volkskirche”. Einen grösseren Erfolg in der Gründung dieser Vereinigungen, zu denen die Priester unter Zwang oder wegen bestimmter Begünstigungen stiessen, hatte die Regierung in Slowenien und Bosnien und der Herzegowina, doch in Kroatien erlitt dieser Plan eine völlige Niederlage. Da die Bischöfe in Jugoslawien, mit der Unterstützung des Heiligen Stuhles, den Priester die Mitgliedschaft in diesen Vereinigungen verboten haben, wurde der Konflikt zwischen der Kirche und des Regimes noch tiefer, die Verhältnisse verschärften sich. Als die jugoslawische Regierung einen Protestbrief an den Heiligen Stuhl schickte, fühlte sich dieser auch zu einer Antwort bewogen, in dem alle Probleme, welche die Beziehungen zwischen dem Vatikan und Jugoslawien gefährdeten zum Ausdruck kamen. Nachdem der Heilige Stuhl dann den Erzbischof Stepinac zum Kardinal ernannte, brach die jugoslawische Regierung die diplomatischen Beziehungen zum Heiligen Stuhl. Riassunto (Conclusione): Chiesa e Stato. Corrispondenza e colloqui tra i rappresentanti della Chiesa cattolica e le autorità statali comuniste in Jugoslavia. Volume I, 1945-1952, str. 768-770. Alla fine della seconda guerra mondiale, il regime comunista jugoslavo vide nella Chiesa cattolica un forte avversario che avrebbe potuto mettere in pericolo la sua esistenza. Il regime comunista, oltre ad accusare la Chiesa cattolica di collaborazionismo con il regime ustascia, non poteva rassegnarsi al fatto che nel Paese vi fosse un’organizzazione così numerosa e potente, la quale, oltre ad occuparsi di questioni religiose, era fortemente impegnata in favore della propria nazione, e che non fosse sotto il proprio controllo. Nello stesso tempo, la Chiesa cattolica non poteva rassegnarsi al fatto che lo Stato, per di più nuovamente di matrice jugoslava, fosse guidato da un’autorità che fondava il proprio agire su un’ideologia ateistica. Già all’inizio di questa simbiosi obbligata di due poteri caratterizzati da visioni del mondo opposte, sussisteva un’aperta insofferenza tra lo Stato e la Chiesa. Sebbene nell’assestamento dei rapporti con la Chiesa cattolica il regime comunista procedesse, all’inizio, con prudenza, le sue azioni nella vita quotidiana crearono un’ulteriore insofferenza della Chiesa cattolica nei confronti delle nuove autorità. Le autorità comuniste avviarono la resa dei conti con la Chiesa cattolica che si manifestò con uccisioni ed arresti di sacerdoti, processi giudiziari montati, divieti della stampa religiosa, l’esclusione dell’insegnamento della religione dalle scuole statali, con molti altri provvedimenti che mettevano a rischio le libertà di fede nonché con la confisca dei beni ecclesiastici. In presenza di tali sfavorevoli circostanze venne attuata la riforma agraria, nonché la confisca, l’espropriazione e la prima nazionalizzazione dei beni della Chiesa cattolica. Per la Chiesa cattolica l’attuazione della riforma agraria rappresentò un colpo particolarmente duro. I terreni agricoli rappresentavano una delle principali fonti di entrate con le quali la Chiesa cattolica si manteneva. La radicale attuazione della riforma agraria sui possedimenti della Chiesa portó la Chiesa cattolica in una situazione materiale molto difficile, cosí che il peso dell’azione della Chiesa ricadde sulle spalle dei fedeli nelle già difficili condizioni postbelliche in cui essi vivevano. In considerazione del fatto che dopo l’attuazione della riforma agraria furono addebitate alla Chiesa cattolica varie tipologie di imposte, anche quelle su ció che rimaneva dei suoi terreni, molte parrocchie, nell’impossibilità di pagare le imposte, furono costrette ad alienare la terra che era loro rimasta dopo l’attuazione della riforma agraria, cioé a darlo in sfruttamento a contadini, cooperative agricole e varie organizzazioni sociali, e incontrando successivamente problemi a farsi restituire quei terreni. Il regime comunista, con a capo Josip Broz, detto Tito, cercò di esercitare pressioni sulle autoritá ecclesiastiche in Jugoslavia affinché esse indebolisse i legami con la Santa Sede e creassero una “Chiesa nazionale” che fosse sotto il controllo delle nuove autorità politiche. A tale politica si oppose in modo particolare l’arcivescovo di Zagabria e presidente della Conferenza episcopale jugoslava, Alojzije Stepinac. Di massima gli altri vescovi lo appoggiarono, sebbene vi fossero anche coloro che erano pronti ad una maggiore collaborazione con le autorità politiche, sebbene mai nel senso di rinunciare alla fedeltá alla Santa Sede. Il regime comunista contava su possibili divisioni tra i vescovi, tuttavia, quando tutti i vescovi sottoscrissero all’unanimità la lettera pastorale del settembre 1945 nella quale condannavano duramente il modo di agire delle nuove autorità, il regime comunista abbandonò ogni atteggiamento tattico e dichiaró guerra aperta all’arcivescovo Stepinac e alla Chiesa cattolica. Esso procedette in modo ancora più duro ad arresti di sacerdoti, al soffocamento della stampa religiosa, al sequestro di beni ecclesiastici, alla riduzione dell’insegnamento della religione, alla chiusura di scuole religiose e a simili provvedimenti che soffocavano le libertá religiose. Il momento di maggiore durezza dell’attacco del regime comunista alla Chiesa cattolica fu il processo e la condanna dell’arcivescovo Stepinac. Tuttavia, nonostante la detenzione di quest’ultimo, le autoritá politiche non riuscirono a mettere la Chiesa cattolica sotto il proprio controllo, e provocarono una sempre maggiore insofferenza verso il regime jugoslavo, da parte sia del popolo croato che della parte del mondo caratterizzata da governi democratici. Con processi montati nei confronti dei membri della Chiesa cattolica e di altri avversari del regime e l’introduzione del sistema monopartitico, nel mondo democratico la Jugoslavia diede di sé l’immagine di uno Stato totalitario. A causa delle circostanze internazionali sfavorevoli, la Jugoslavia continuò bene o male a mantenere i rapporti diplomatici con la Santa Sede. Al tempo del conflitto tra le autoritá politiche jugoslave e l’Unione Sovietica si giunse ad un’apparente attenuazione dei conflitti tra la Chiesa e lo Stato. Tuttavia le autoritá politiche continuarono a progettare il modo in cui spezzare l’unitá della Chiesa cattolica. L’ultimo tentativo di attuare tale scopo fu la fondazione di associazioni del clero. Scopo delle autoritá era quello di distruggere, con queste associazioni, l’unità della Chiesa cattolica, cioe di indebolire l’autorità della Chiesa, e in questo modo realizzare il proprio scopo di fondare una “Chiesa popolare”. Nella fondazione di tali associazioni le autorità politiche ottennero un successo leggermente maggio­re in Slovenia e in Bosnia-Erzegovina, sia obbligando con la forza il clero ad aderirvi, sia offrendo dei vantaggi, mentre in Croazia il tentativo fu caratterizzato da un completo insuccesso. I vescovi della Jugoslavia, con l’appoggio della Santa Sede, vietarono ai sacerdoti di essere membri di tali associazioni, e quindi si giunse ad un nuovo inasprimento dei rapporti tra la Chiesa cattolica ed il regime comunista. A motivo di tale decisione il governo jugoslavo indirizzó una lettera di protesta alla Santa Sede, la quale rispose con una propria lettera di protesta, in cui faceva presente tutti i problemi che turbavano i rapporti vaticano-jugoslavi. Seguì la decisione della Santa Sede di nominare cardinale l’arcivescovo Stepinac, a seguito del­la quale il governo jugoslavo ruppe i rapporti diplomatici con la Santa Sede. Kazalo osoba, mjesta i pojmova, str. 771-820.